A joint statement released with Obama and Abe’s meeting reveals the focus of the alliance moving forward. That common vision was defined in the U.S.-Japan Joint Vision Statement issued alongside the Obama-Abe meeting. It included a strong emphasis on shared values. “Together we have helped to build a strong rules-based international order, based on a commitment to rules, norms, and institutions that are the foundation of global affairs and our way of life,” the statement intoned. The Statement described the meeting between Obama and Abe as a “historic step forward in transforming the U.S.-Japan partnership” by affirming and endorsing Abe’s doctrine of “Proactive Contribution to Peace.” Specifically, the new Guidelines for U.S.-Japan Defense Cooperation will “update our respective roles and missions within the Alliance and enable Japan to expand its contributions to regional and global security.” Even though Japan does not face a traditionally defined “threat,” according to Japan’s Ambassador to the U.S. Kenichiro Sasae, it does face significant strategic challenges that will require Japan to upgrade its own capabilities and its ability to cooperate with the United States. For Japan, an economic giant but military dwarf, the U.S. commitment to its defense is of absolute importance: Japan wants as many assurances as it can get that the U.S. acknowledges its security and prosperity is “intertwined” and “inseparable” with Japan’s, and “not defined by national borders.” The importance of the Trans-Pacific Partnership (TPP) to the relationship was also acknowledged in this context. The Statement also gave a comprehensive overview of Japan’s “enduring contributions to global peace, security and prosperity,” acknowledging Japan’s role as a U.S. ally in the Cold War, the war against terrorism, as well as U.S.-Japan cooperation in dealing with the March 11 disaster, missile, and nuclear threats from North Korea, and various transnational challenges. If this section is intended as a message for China and South Korea, it’s likely to backfire, as China and South Korea already accuse Japan of not being “devoted” enough to achieving reconciliation with them. Of course, this Statement is about the United States and Japan, but it would be remiss to believe that policymakers from Asian countries will not be scrutinizing this document for any hints about Japan’s attitude toward the region. During their joint press conference, Obama and Abe were much more upfront about naming their concerns. Obama thanked “Shinzo” for his deep commitment to the alliance, and Japan for “standing together for security and human dignity around the world” by cooperating with the United States against Russian aggression in Ukraine, the Islamic State in the Middle East, and Ebola in west Africa, as well as for cooperation in aiding Nepal. While the Statement did not directly refer to the disputed Senkaku/Diaoyu Islands, in his prepared remarks, Obama did promise that the U.S. commitment to Japan was “absolute,” and that it included the Senkakus. Obama also specifically mentioned China’s land reclamation projects in the South China Sea and North Korean missiles and nuclear threats – and an issue especially dear to Abe and Japan, the Japanese abductees – as challenges. While Obama mentioned the value of trilateral cooperation with South Korea and with Australia, such references were missing from Abe’s prepared remarks. 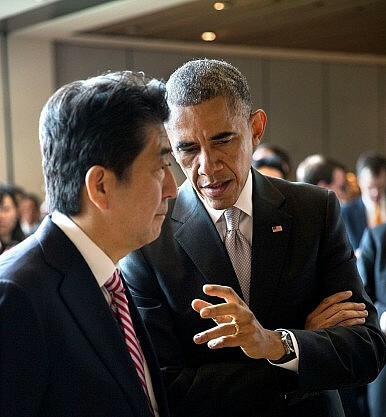 Both Obama and Abe agreed that the U.S.-Japan relationship is good for the Asia-Pacific region and the world — and that this should not be seen as a “provocation” to China, but a “continuation” of a policy to ensure stability where there are “diplomatic conflicts” and “healthy economic competition” but also “forward progress” for “a whole host of nations,” with the U.S. serving as an Asia-Pacific power. The U.S.-Japan alliance, a geopolitical constant in Asia’s shifting and confusing strategic landscape, was born out of national self-interest and necessity in the 1950s. Though many U.S. and Japanese leaders have pushed for a greater role for Japan in the decades since, the Japanese public was never willing to countenance such a radical change in Japan’s global role. However, the “fresh challenges” listed in the Statement may force a greater acknowledgement among the public that for Japan and the U.S.-Japan alliance to prosper, Japan must be willing to do more.